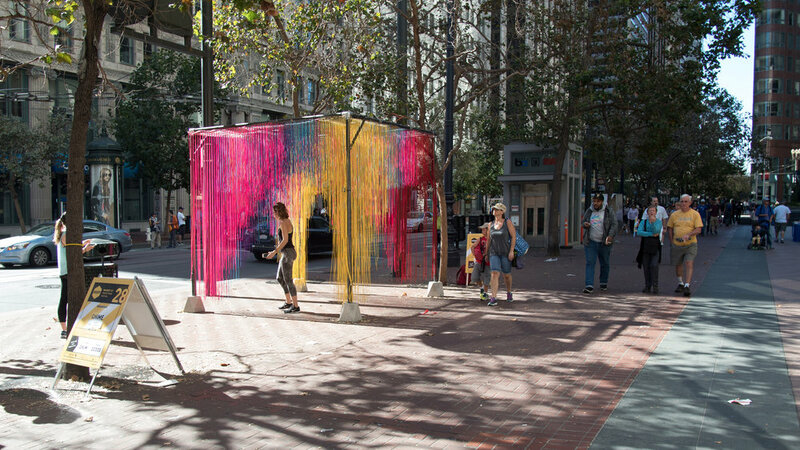 Glimmer is a dynamic, temporary installation for San Francisco’s Market Street that invites passersby to enter, touch, and interact with a plush thicket of colorful suspended filaments. 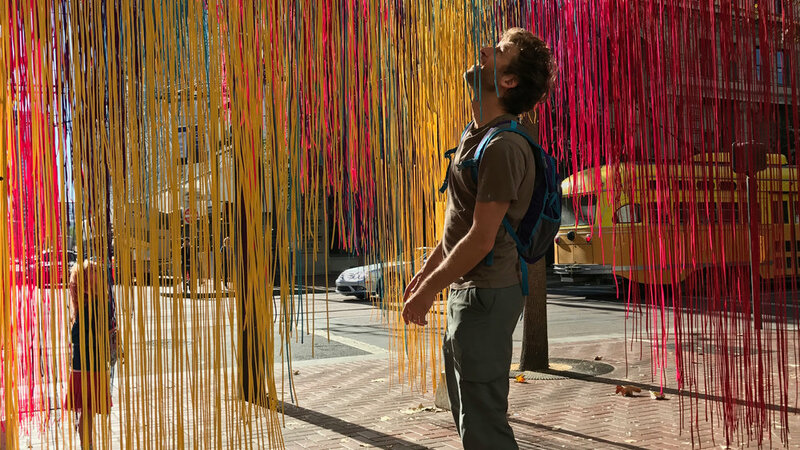 These strands, consisting of colored paracord suspended from a simple steel and wire mesh canopy, are cut at varying lengths to form a single volume reminiscent of an architectural vault. 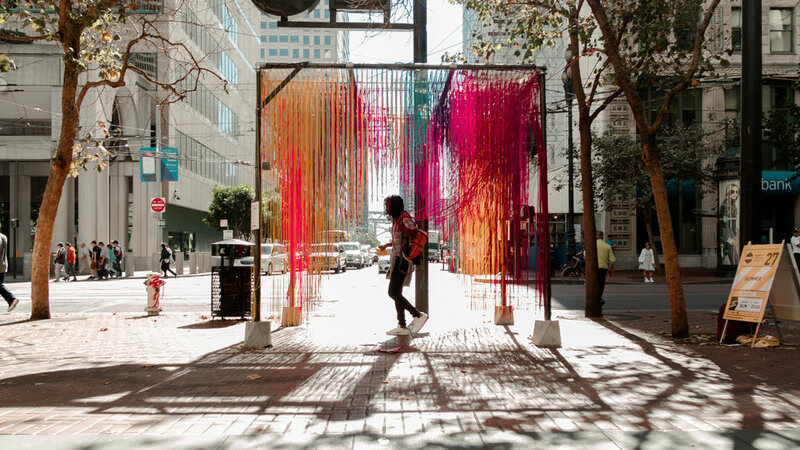 The structure’s colorful softness provides a welcome diversion from the everyday pedestrian experience—an immersive, tactile oasis of brightness within the urban landscape. The installation reinterprets the typology of a masonry vault—typically heavy, solid, and static—and recasts it as a light, porous, and highly dynamic structure. Glimmer dematerializes a familiar symbol of structure, stability and fixity into a kaleidoscopic, indeterminate environment of fibrous material that is constantly in flux. 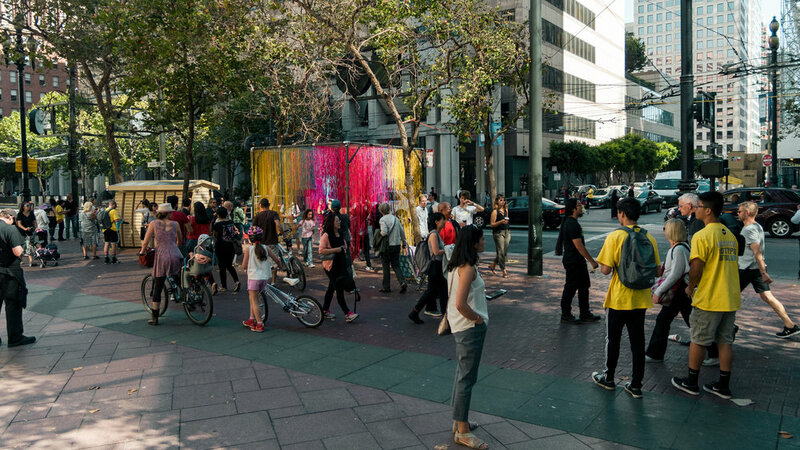 Its mirage-like quality—disappearing, then reappearing, as it indexes the changing sunlight and local airflows along Market Street—generates multiple readings at multiple scales for passersby. From afar, the hanging cords coalesce into the form of a solid vault; yet this figure is constantly shifting as it reacts to the airflow of its surrounding environment. 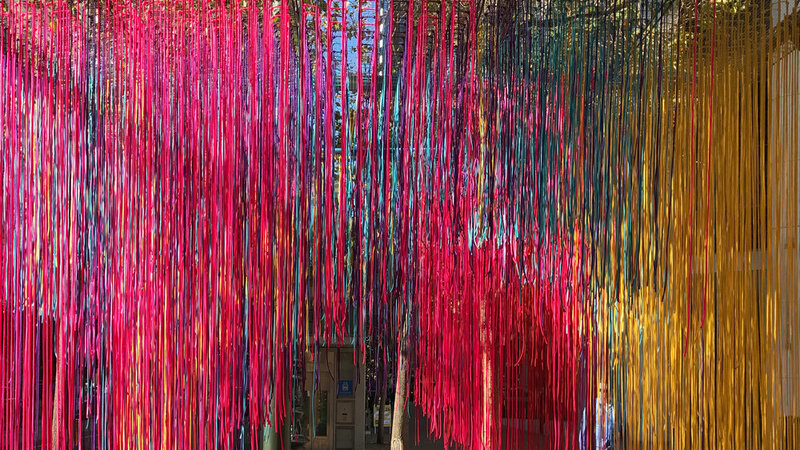 As visitors approach the installation, they are encouraged to enter and inhabit the structure’s soft “poché," and to touch and interact with the soft hanging cords. Glimmer was commissioned for the Market Street Prototyping Festival, a design competition jointly sponsored by Yerba Buena Center for the Arts and San Francisco Planning Department that challenged artists and architects to reimagine public infrastructure along the city’s primary urban thoroughfare. 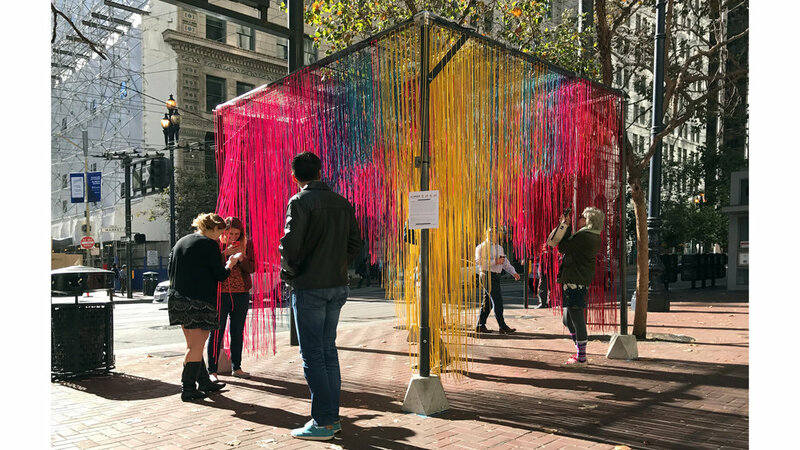 For four days in October 2016, Glimmer was installed on Market Street in San Francisco's Financial District, where thousands of pedestrians interacted with the bright, colorful, and dynamic addition to the streetscape. The structure attracted people of all ages, sizes, backgrounds, and dispositions to depart from their conventional day-to-day sidewalk routine and engage in a moment of light playfulness that is not commonly seen in the urban realm.